Dive in! Alexandra Posen’s vivid, sensual, inspiring art is far more than just a metaphor or mantra—for those of you in or visiting Los Angeles this month, it’s real—right here, right now! DIVES is the kick-off of my West Coast art program this year in LA. I was honored Alexandra (who shares my mantra for body and spirit in her work) agreed to work with me as I curated her works for the January art series at Soho House West Hollywood. A few weeks ago she discussed DIVES with me and elaborated on her inspirations, intimate stories, and materials used in her process. As a result, I gained a newfound respect for swimming, a clearer understanding of the spiritual connection with the water, and clarity on why this body of work is touching so many people . Reach out here to learn more! 1. What was the most pivotal moment in your life that inspired your first series of works? One of the most pivotal moments for me was seeing Louise Bourgeois’s work for the first time and recognizing in it the way for many artistic disciplines to inform each other. As a result, my path as an artist has been adventurous in that it has melded performance, poetry, fashion, dance and visual art as modes of expression. 2. Tell us about the title of this series, why is it called DIVES? In this new series of work, the oblique strokes cutting across the paper represent a literal diving in: head first plunges into the unknown. A dive is an action that springs from the earth, passes through the air and submerges into the depths of water. It is a liminal act, a threshold crossing and an act of extreme faith. Dives are a particular moment that marries intention with release, and captures a complex current of energy that flowing through the body. On a metaphysical level, dives are a rare instance of physical dissolution: where the delineation of self and outside dissolves for a fleeting second, and one experiences an exhilarating oneness. Dives are about being profoundly alive. Posen at work in her Brooklyn studio, December 2017. 3. Describe one of your most memorable stories from the DIVES series. Each piece in this series is titled and connected to a formative life moment- a memory revolving around diving, water and growth. These memories are codes for transcendent and transitional moments of my life: letting go, feeling profound inspiration, deep peace, turning a corner, embarking, falling in love, feeling wonderment, fear, and risk taking. "Mantra in the 16th" refers to a time in my life when I had graduated from Brown University and just moved to Paris in order to study physical theater. The city was a coiled up mystery to me, and so, as a way to unfold its secrets - I went from arrondissement to arrondissement swimming in the various municipal pools. I made up mantras to accompany my strokes. The one in particular that inspired this piece was “mind your eggplants”. It was a fragment from a letter that a dear friend wrote to me from Japan. The phrase referred to learning how to prune plants. How to feel their essential life flow, and pair away the unnecessary movement and excess. Mantra in the 16th is me swimming the breaststroke while watching the Eiffel Tower through the pool’s skylight, and reciting this mantra as I did laps back and forth. 4. You describe your DIVES series as meditative. Can you elaborate on this? DIVES is about body and spirit: finding these ecstatic and dynamic moments in materials. 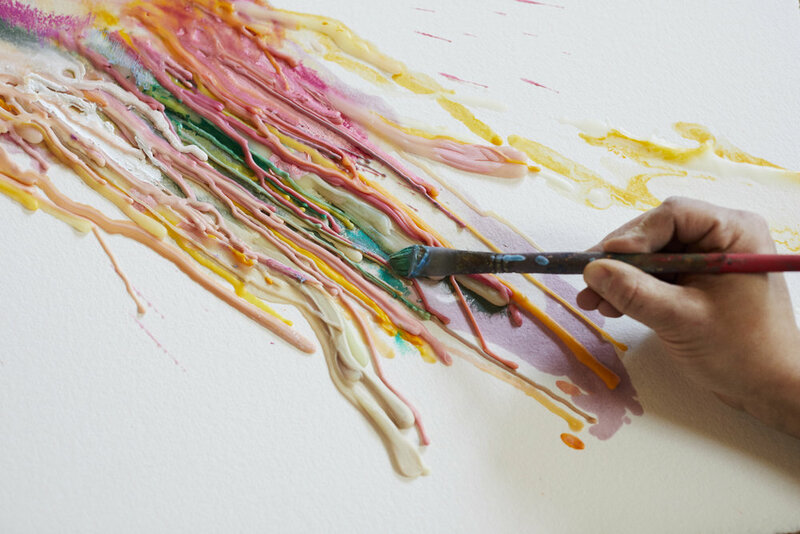 My process is a collaboration and dance with the magical substances of encaustic, oil paint, and oil pastel. I listen deeply to the will of the wax (which acts almost like a viscous watercolor) and let impulses, corporeal intelligence and the subconscious guide. I like to work in the quiet of the morning. 5. Why do you use beeswax in your works and is there beeswax in all of your works? I recently came across this quote from Maria Popova, and it speaks to me about the qualities and meaning that I associate with wax: She wrote: “fluid currents in an ever-shifting, shoreless self”. Encaustic is an ancient medium that has historically been employed as an articulation of portraiture and human presence. Wax has a life like quality to it, its translucent nature breathes. It brings an uncanny depth to color and layering. 6. I understand you come from a creative family of artists. Can you tell me a little about them? I come from a profoundly creative family and upbringing. My father, the painter Stephen Posen, was teaching me and my brother the designer Zac Posen how to draw and sculpt from a very early age. Art was our religion, and we learned early on to see life through an imaginative and poetic lens. 7. How many works are in the DIVES series and how long did it take you to complete it? The series is ongoing. There are 13 works so far. I began working on the series in June of 2017. Learn more about Alexandra Posen.